Native to the northern hemisphere, the large earth bumblebee is a fat, hairy bee that generally builds its colonies underground. 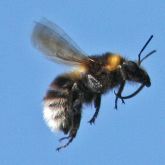 The large earth bumblebee was introduced to New Zealand many years ago and is now established there. In 1992, it was also deliberately introduced to Tasmania, where it is now widespread. In Queensland, a single specimen was found at Fisherman Island in Brisbane in May 2003. Australia has no native bumblebee species, although some native bees may be mistaken for bumblebees. The large earth bumblebee competes with native species and is a specialist pollinator of some weeds. The native bees pictured below are often mistaken for the large earth bumblebee. Worker bees are 8-22mm long. Queen bees are up to about 25mm long. Body is black with one yellow/ochre band across thorax and another across abdomen. Tip of abdomen is buff or white. Makes loud buzz when flying. Nests usually found about 10cm under soil surface. Reported locations include old rodent nests (inside sheds or outdoors), compost heaps, piles of leaf litter and grass clippings, woodpiles, old stuffed chairs and sofas, covered drains, cavities underneath concrete paths or houses. Single specimen found at Fisherman Island in Brisbane in 2003. Life cycle similar to that of honeybees. Queens hibernate over winter and form new colonies as weather warms in spring. Thriving colony contains all castes of bee (queen, worker and drone). Competes with native honeybees for nectar. Is specialist pollinator of specific weeds. Can sting repeatedly; stings may cause severe allergic reaction in some. 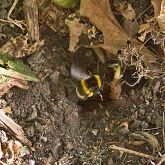 Call 13 25 23 if you find a bee you suspect may be large earth bumblebee to seek advice on control options. 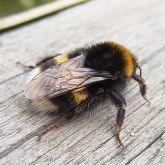 The large earth bumblebee is a prohibited invasive animal under the Biosecurity Act 2014. 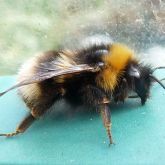 By law, everyone has a general biosecurity obligation (GBO) to take all reasonable and practical steps to minimise the risk of the large earth bumblebee escaping until they receive advice from an authorised officer.